May 26, 1900 –An invasion of the “District of Lake Michigan” from land and water is planned as 600 police officers, 16 patrol wagons, and two unarmored tugs carrying three-inch field pieces advance on territory held by a rag-tag band who pledge allegiance to Captain George Wellingtonn Streeter. The whole affair is put on hold, though, as one Lincoln Park policeman, William L. Hayes, spoils everything “by calmly ambling into the district alone and arresting the entire army of invasion, [taking] their cartridge belts away from them, [kicking] their mud fortifications down, and marched them off to the East Chicago Avenue Police Station.” [Chicago Daily Tribune, May 27, 1900]For over a dozen hours the 13 men of the invading army defied the police, but their numbers dwindled as the day wore on and only five remained when Hayes walks into the encampment. The group had earlier formed an invading party as a boat carried them from South Chicago to the area on the lake just north of the river now known as Streeterville. After the “invasion” at 2:00 a.m., a proclamation was issued that reads, “Now, therefore, we, the property-holders of the District of Lake Michigan, do declare the District of Lake Michigan to be free and independent from the State of Illinois, the County of Cook, and the City of Chicago, and that we will maintain our independence by force of arms to the best of our ability, and all armed forces except those of the United States military, coming into this district, will do so at their peril.” Early morning strollers along the new Outer Drive near Superior Street are surprised to hear a sentry’s order to halt and identify themselves. Things progressively become more serious. Captain Barney Baer of the Lincoln Park police retreats after his horse is shot and killed, the bed of his buggy splintered, and a bullet “bounced … with great nicety off the top button of the Captain’s coat.” After a lengthy conference at City Hall it is decided that “the State, the county, and the city should move out to attack the insolent foe hand in hand.” The tugboat John Hayis outfitted with two field guns as is the fire tug Illinois as 600 policemen from all over the city form ranks in front of the Chicago Avenue pumping station. But … “Just as the long line of blue heroes was beginning to throw out skirmishers down Chicago avenue, and just when Admiral Fyfe was wondering whether he should open fire from the field guns, with brick bats or six cans of sweet corn” Hayes, the lone Lincoln Park cop, decides things have gone far enough. He walks into the fortifications of the enemy and says, “Say, fellers, cut it out.” As “the long line of blue heroes” continues east along Chicago Avenue toward a glorious battle, the defenders of the District of Lake Michigan stand down and are marched west on Superior Street to the East Chicago Avenue police station where they are charged. "A" in the above graphic pinpoints where George Streeter's boat, the Reutan, went aground in 1886. "B" shows where it was hauled ashore in what is today Streeterville. 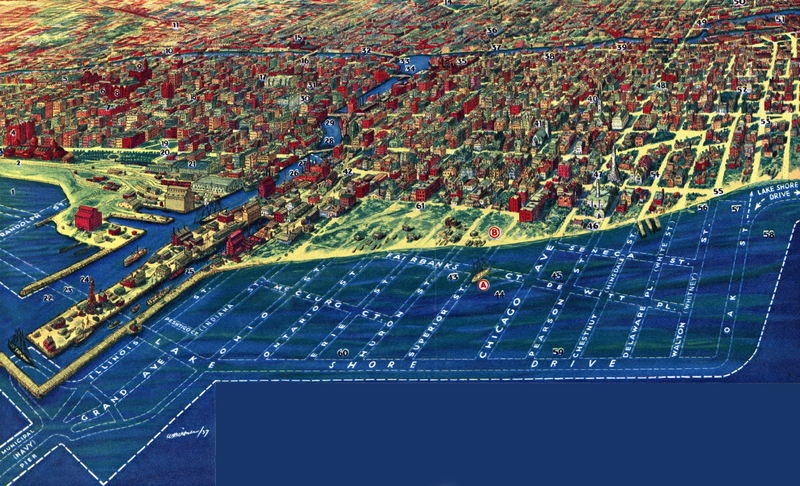 Note that at the time the Chicago water tower, just to the right of "B," sat on the edge of the lake. 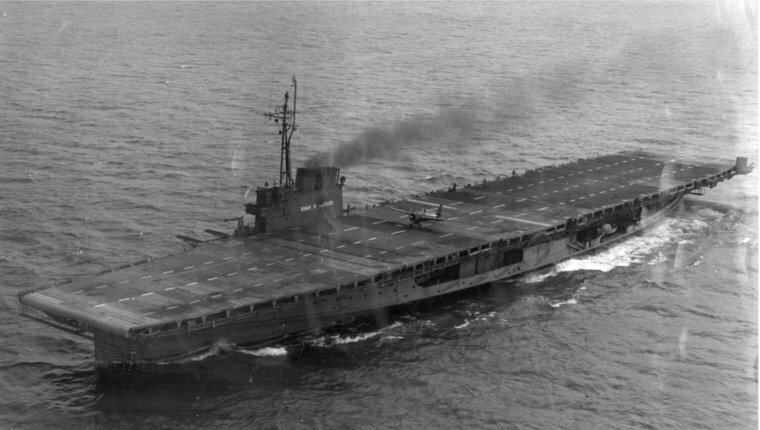 May 26, 1943 – The capacity to train aircraft pilots in the Great Lakes doubles as the U. S. S. Sable joins the U. S. S. Wolverine, which has been carrying out carrier operations off the Chicago lakefront since August of 1942. The Sable, converted from a sidewheel passenger vessel known as the Greater Buffalo of the Detroit and Cleveland Navigation company, is somewhat larger than the Wolverine. She is outfitted with a 12,000-horsepower engine that can deliver a speed of up to 20 knots and has a length of 550 feet and a beam of 100 feet. 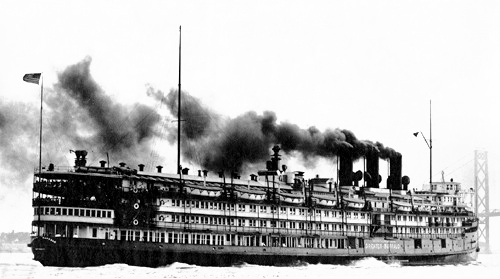 As a passenger ship the Sable had room for 2,120 passengers and 1,000 tons of freight. Since all of the planes that practice landings and take-offs on the ship will be based at the Glenview Naval Air Station, there is no need for a hanger deck and money is saved in re-fitting the ship by retaining much of the fine furniture, china and linens that were a part of the ship’s previous life. Captain W. K. Berner, a Navy pilot since 1924 and a 1922 graduate of the United States Naval Academy, will command the Sable. The Executive Office will be Commander H. H. Crow, a Naval reserve officer since 1909, a veteran of World War I, during which he served aboard the U. S. S. Tacoma and the U. S. S. Buffalo. The photos above show the Greater Buffalo and the U. S. S. Sable. 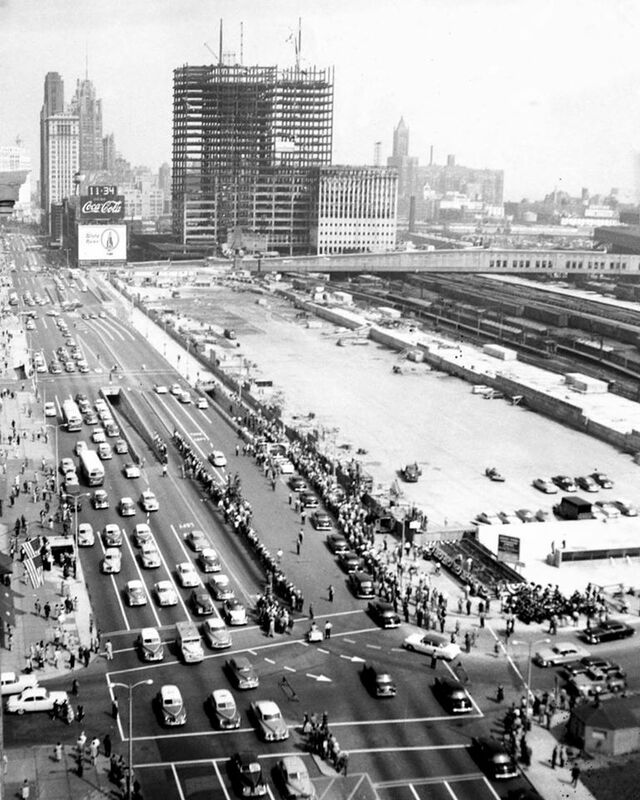 May 26, 1952 – The Chicago Park District unveils a $2,500 model of the underground garage that it is preparing to build in Grant Park. Anticipated plans have the garage situated between Randolph and Monroe Streets and between the Illinois Central railroad tracks to a point within 40 feet of buildings on the west side of Michigan Avenue. The two-level garage, 23 feet below Michigan Avenue, will occupy 400,000 square feet and will hold 2,500 cars. Fees will be 45 cents for the first hour and 15 cents an hour after that. The first hour today will cost you 23 bucks. The photo above shows the 1954 opening of the garage with the Prudential building, finished a year later, under construction in the background.